In LANSA, whenever a function is moved, the process is also moved to protect the structure, that is, there must be a process for the function to be contained within. The Lock functions to same task as process setting on the LANSA for i Master System will disable the task tracking logic that enforces that all functions to be locked with the same Task ID as the parent process. This flag only applies when the Allow user to change tasks while working? task tracking option is set to NO. This setting is stored as the *TTG6FUNCLOCKING value in the DC@OSVEROP data area. Note: *U and *T tasks perform the same way. If the process and function are placed in Visual LANSA by propagation, they will be read only. 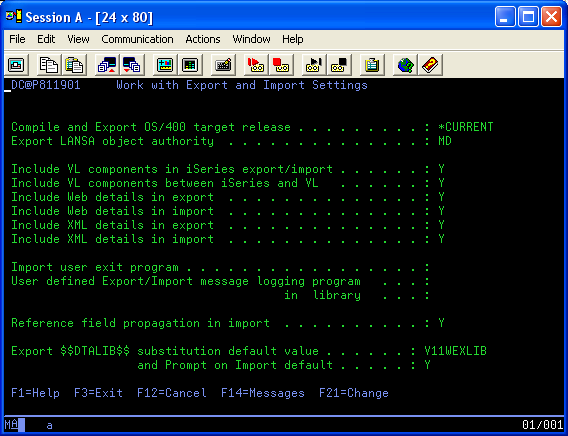 If the process and function are moved to Visual LANSA by export, the process can be set as read only or update. WEBEVENT applications require special consideration as there are several HTML definitions associated with a process which can cause overwriting problems (e.g. LAYOUT, MENU, etc). Various web settings for Import and Export processing are available on the IBM i Master. These are described in Export and Import settings. These settings can be set as required to restrict the movement of associated HTML pages. For example, you may want to move the HTML for the function but not the HTML for the process. This can be achieved by moving the Process as "Read only". The function can be moved for "Update". This has the effect of checking out/ in the function without the process. This can also be achieved by using the Lock functions to same task as process setting. The HTML definitions included in the import / export are determined by the Import and Export system settings. Note: When Lock functions to same task as process setting is set or the Check-in Unlocking or Export and Import settings are changed, the system definition in Visual LANSA must be refreshed and the host monitor stopped and restarted. Ensure that the host monitor has stopped before restarting.